Here is the poncho I wore bushwhacking to North Seward. Was meant to be a repeat use poncho. Not anymore. Looks like someone threw steak on it and released a pack of wild dogs. Definitely helped keep me drier during the hellish snowy bushwhack (while it lasted). Luckily, I can use the remnants for a ticker-tape parade. Wow, some trip. 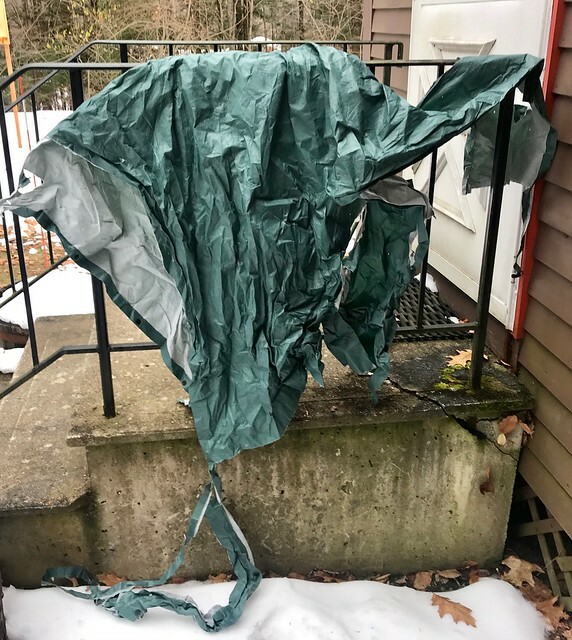 I had similar poncho damage as a kid when we had to bail off Emmons due to thunderstorms to the Cold River trail and hoof back to Ward Brook LT. Brutal. Can you post a map of your route? Curious which bump you're referring to. I approached via the Calkins Brook trail ascending at about the 900 meter contour. Definitely a hard whack to do in snow! Dude, just a thought, but ponchos may not be the best gear choice for bushwhacking through thick brush in wet weather. Maybe you should ask for some better outdoor gear gift cards this holiday season. I had all my good "holiday" gear on underneath the Poncho. The fact is, the best gear choice for thick wet brush is to not venture into it at all, because even the best gear will leave you drenched in those conditions. I put a poncho on over my good gear as a ventilated tarp-like barrier to delay the inevitable drenching process that comes with thick wet bushwhacking. I knew it would be torn to a shag rug, I just didn't think it would get torn to such a gnarly degree. Normally, I would have not ventured out to do North Seward, but I wanted to climb it before the snow got too deep. Thick bushwhacking in wet/snowy conditions is where I draw the line and stay home to watch Scooby-Doo. I've heard it can get pretty rough. I bought a lot of new gear last winter and it all got pretty torn up.